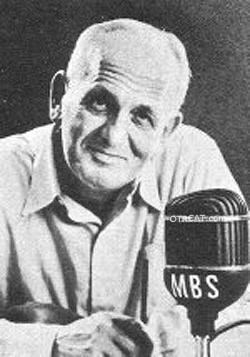 All news was good news for Gabriel Heatter, an American radio news commentator famous for his uplifting and positive broadcasts during World War II. Heatter's sign-on catchphrase, "There's good news tonight" earned him a reputation for optimism that was rare in his field and appreciated by audiences. Heatter was born in 1890, the son of immigrant parents in New York City. His rise to radio fame was unconventional: he struggled in school, but a love of reading and an uncommon speaking ability brought him an opportunity as a sidewalk campaigner for William Randolph Hearst. This experience sparked an interest in journalism, and he became a reporter out of high school, first in the society column of tiny weekly, The East New York Record, then moving on to The Brooklyn Times and then Hearst's New York Evening Journal. Intriguing articles led to radio appearances, and his performance and style impressed listeners and radio professionals alike. His big break came in 1935 when he covered "the trial of the century" of Bruno Hauptmann, the man accused of kidnapping the Lindbergh Baby. His ability to give concise, accurate reports without sensationalism solidified his standing as one of the country's most influential radio commentators. Heatter's World War II broadcasts showcase this dignified optimism for which he was famous. Finding a bright side to every story, debunking propaganda and rumor, and including human interest narratives to his broadcasts, Heatter became a bright light in a dark time for America, and influenced many generations of up and coming journalists. Be the first to comment on "Gabriel Heatter"